Non Contact (Short range I.R.) RFID Sensor responds to change in distance between it and the object (or a change in light level). Ideal for no contact object sensing (whereas a trembler alarm is prone to false alarms) for valuable picture frames, areas of high background vibration etc. Ultrasound Sensor responds to intrusions in a confined space. Ideal for display cases (small and large) and small rooms. Sensitivity is adjustable. Battery life: 8 months and 6 years with optional battery expansion pack. Personal Alarm responds to pressing the button. (Short and long press options) Can be portable or fixed location. Ideal for internal communication for assistance. BarrierPIR detector responds to movement of heat source (e.g. a person's). 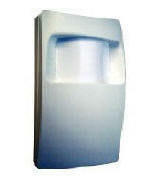 Ideal for damage prevention in front of unglazed paintings or objects on open display. 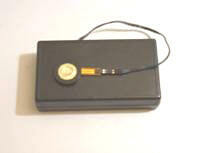 This can communicate to a GalleryMaster receiver or repeater via GM Transmitter. 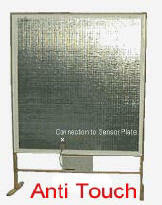 Environmental Sensor records temperature and humidity measurements and reports back to GalleryMaster. Allows alarms to be set up where measurements go above / below pre-sets. Slimline, black case. Size: 79 x 39 x 9 mm. Battery life: 3 years, uses 2354 Li 3v coin battery.